Why it is better to look beyond email communication atleast in DC's? When email works, it’s effective, but when it fails it can be a big problem. At times, emerging social media capabilities may provide a more effective way of sharing information and collaborating in real time. Let’s take a small example: Have you ever held a meeting and everybody showed up except that one team member that was off sick without a back up? Maybe you had to postpone and send everyone away because key information from that team member was not available. Perhaps no one saw the email about that one pending task assigned to the absent team member. All in all, it turns out to simply be an annoying delay—but in other business scenarios, it could be a critical problem. Imagine a similar thing happening in an operations scenario where the million-dollar shipment has to go out in the truck at 4:00 PM but still don’t have any information from that absent team member. The impact is tremendous if the shipment goes out or is prepped without that information. And if this key team member is coordinating with several other groups, the impact is even greater. The activities of several groups might come to a grinding halt. Or to take a smaller example, how often does a group of collaborators promise to “reply all” with status updates—only to have sending those updates get lost in the fray of busyness? Too often. Last week, we were doing a demo of our In Command Mobile Eco System to a Retailer’s Supply Chain team. We started to show the communication features within our devices, including texting capabilities and Facetime support to allow for quick communication with a supervisor. The operations leader asked us if we have capabilities to enable communication within a team, something similar to Facebook or the Whats App real-time messaging platform. This type of feature allows for true collaboration, and the sharing of tasks to allow for quick responses. The team stays in synch. If one person is not able to address the issue the other team member jumps in to help, it is much easier to ask for help within the team if one team member is overwhelmed etc. The ability to stay on top of things. Within her multiple groups of friends, she is always up to date on what is happening among her friends from school, her family and friends from work. Sometimes, all her friends from work jump on a WhatsApp discussion to have official conversations that may be deemed sensitive within their office communication tool Hipchat. The ability to share a picture, video or any file and share it easily among multiple groups. The ability to reach a person irrespective of where they are. My friend knows people all over the world. When she reaches out, even if she doesn’t get a response from a person she is trying to reach, somebody else jumps in and offers information. These interactions all happen over mobile devices. This type of tool offers some really promising benefits in an operations scenario and even within a project team, where teams come together to accomplish a specific objective, work together for a few months and then go away once that objective is accomplished in a matrix based organization. Remember wherever we go, we always work in teams and team members have to stay in sync in order for the team to function effectively as one cohesive unit. The speed and scale of adoption of social technologies by consumers has exceeded that of previous technologies. Yet, consumers and companies are far from capturing the full potential impact of these technologies. Indeed, new uses, technical advances, and social business models will evolve—driven by user innovation and advances in technology. Almost any human interaction that can be conducted electronically can be made ‘social,’ but only a fraction of the potential uses have been developed (e.g., content sharing, online socializing). Today, only 5% of all communications and content use in the United States takes place on social networks. Two-thirds of the value creation opportunity afforded by social technologies lies in improving communications and collaboration within and across enterprises. By adopting these organizational technologies, we estimate that companies could raise the productivity of knowledge workers by 20 to 25%. However, realizing such gains will require significant transformations in management practices and organizational behavior. 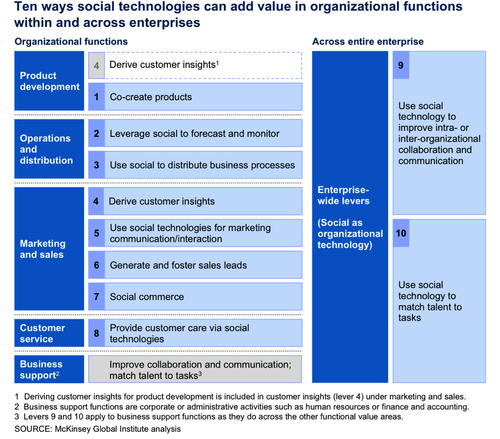 Social technologies can enable organizations to become fully networked enterprises—networked in both a technical and in a behavioral sense. The time savings can also be substantial, since the average knowledge worker spends most of his or her time, as much as 28 hours per week, searching for information and collaborating internally, the report said. save not only the amount of time they spend on writing, reading, and answering e-mail, but also on the amount of time spent searching for content and expertise. Collaboration tools can reduce time spent emailing by 25%, freeing up seven to eight percent of the workweek for more important activities, McKinsey estimated. By using collaboration tools to share information, users can cut time spent searching for desired data by 35% (capturing 6% of the work week). Having shared these findings, the timing is appropriate to start thinking about better tools that can be utilized to make working in a team better especially in a warehousing, distribution and operations scenarios. Let us know in the comments section below.